More than 5 million Americans live with Alzheimer’s disease, the sixth leading cause of death in the United States. 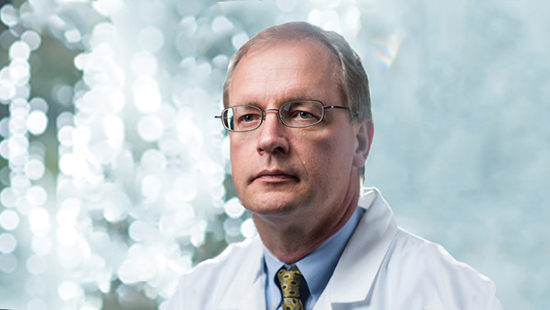 At the University of Missouri-Kansas City School of Medicine, faculty researcher Peter Koulen has found an innovative way to diagnose the early stages of the disease – with an eye exam. When you discover memory-loss issues early enough, there are many things you can do to prevent symptoms from worsening. But currently, there is no single straightforward exam or test for diagnosing Alzheimer’s, which is what makes Koulen’s discovery so promising. The current method is an often cumbersome, time-consuming process of eliminating other potential causes of a neurological disorder. Results can be inconclusive until the disease has progressed to a more advanced stage. By that point, treatment and patient care has become a primary concern. A more rapid and conclusive diagnosis is possible with the test Koulen has developed at the School of Medicine’s Vision Research Center, where Koulen has served as director of basic research since 2009. It can easily be given in a clinic or other settings. It provides a non-invasive, fast-screening tool for the detection of early stages of Alzheimer’s and of mild cognitive impairment, a precursor to Alzheimer’s. Koulen’s work received a patent in January and has been attracting attention since. 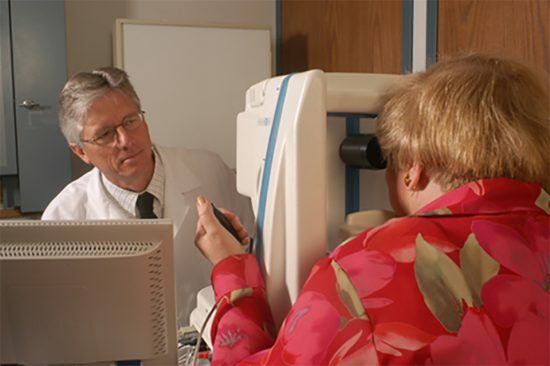 The test uses a microperimeter, a machine routinely used in eye exams to evaluate retina function, and typically takes less than half an hour. It is a relatively straightforward test to take: Patients look at a display similar to the vision test at the DMV and press a button when they see a flash of light. A computer program progresses through a series of flashing lights in various locations and intensities to measure the person’s retinal function. It’s basically a boring video game that the patient plays for a few minutes. This technology, also called microperimetry, is already routinely used by ophthalmologists. Over the years, different uses for it related to eye diseases have been established, and the Alzheimer’s diagnostics is one example of that. What led you to this discovery? We’ve worked about half a decade on this. The technology evolved through researching therapies for glaucoma, macular degeneration and diabetic retinopathy — all major eye diseases affecting the retina. These have been the focus of much of our work at UMKC. The retina, a light-sensitive tissue, is part of the body’s central nervous system and is connected to the brain. Our team spent about seven years developing a still-growing database to define a baseline for healthy retina function. Using microperimetry, we were able to recognize subtle deviations from those baseline figures beyond normal aging. We linked those deviations to what we realized could be indicators of early-stage Alzheimer’s and mild cognitive impairment. How long until the eye exam is available to patients? Because it was developed through clinical studies with patients and subjects, the transition from discovery to use in clinics could be relatively short. In addition, the microperimetry technology has already been approved by the FDA, which will speed up regulatory approval for use outside of ophthalmology applications. Compared to other translational research, like creating a new drug, which could take a decade or more of development, our technology could be helping patients in the very near future. With support from the university’s Office of Technology Commercialization, our technology is now drawing interest from medical device manufacturers and companies active in disease diagnostics. The technology also has received overtures from regional and international investors interested in licensing the technology and forming a startup company to further develop it. So it’s an exciting time while we work on the next steps. UMKC faculty are experts in their fields and gain international attention for their research. Tags: 3 questions, community impact.